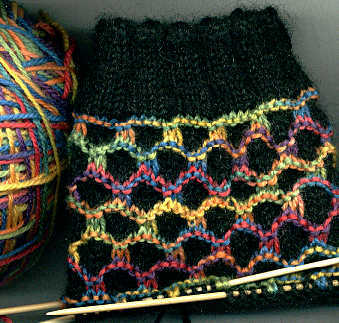 Use a slip stitch pattern to give variegated yarn the color "feel" of how the color looks in the ball. This is the lovely Lorna's Laces Sockknitter's Rainbow yarn on a background of black alpaca from Ozyarn...the alpaca is super soft and silky...not to mention that Judy mailed it from Australia on Thursday and I received it on Monday! 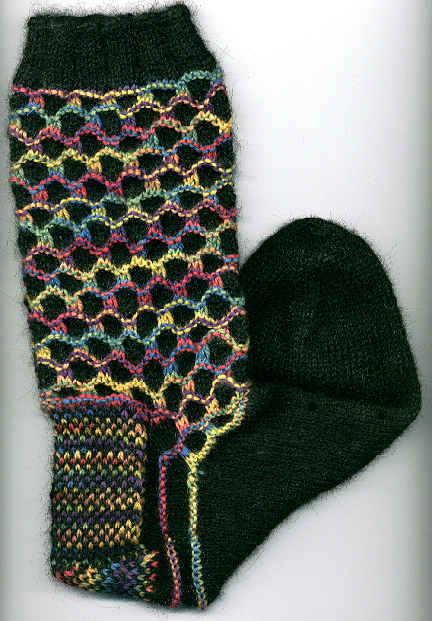 The slip stitch pattern is a variation on the one used in the child's sweater "Color at Play" in Knitters #62, Spring 2001...plopped onto a generic sock pattern :-) After seeing Jackie's "Circle of Friends" sock, I wondered what it would look like in two colors...stained glass effect.